Visit a place where your accent is an aphrodisiac, invites a Las Vegas tourist board ad on the London Underground. Just the right amount of wrong, offers another from The Cosmopolitan Hotel. Clearly, it works. 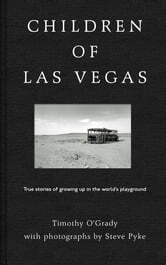 Over forty million people a year travel to Vegas, more than to Mecca. It is a global celebrity, an improbable oasis, a place offering bank-breaking fortunes and instant gratification, 24/7, with no moral debits. Start planning the vacation you won’t write home about. What happens in Vegas stays in Vegas. O’Grady here renews his partnership with renowned photographer Steve Pyke. 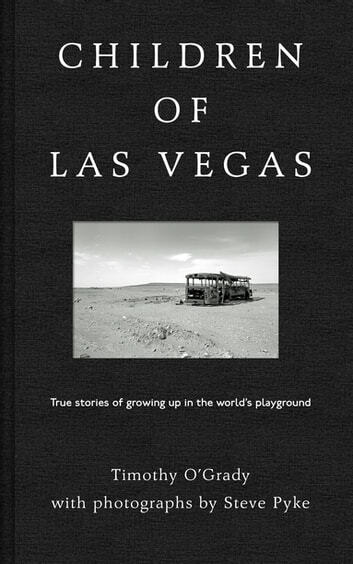 Through short essays, Pyke’s portraits and ten witness testimonies, he pierces the city’s glittering façade.Children of Las Vegas shows us what we can expect to find when the global marketplace has found the addiction genes in us all. It is a book of broken dreams, but also of an extraordinary striving for transcendence.